"Easy and fast! My kids love when I make these." Mix together the ground turkey, steak seasoning, corn flake crumbs, and maple syrup in a bowl until the mixture is thoroughly combined. Heat the canola oil in a skillet over medium-high heat, and scoop up about 1/4 cup of the turkey mixture. Form the mixture into a patty, and place into the hot skillet. Repeat with remaining turkey mixture. Pan fry the patties until browned on both sides, 5 to 8 minutes per side. Remove patties to a cooling rack to drain. Place the patties into a baking dish in a single layer. 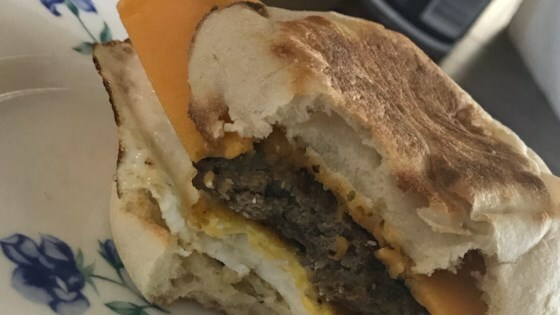 Bake in the preheated oven until the patties are no longer pink inside and an instant-read meat thermometer inserted into the center of a patty reads at least 160 degrees F (70 degrees C), 20 to 25 minutes.